NORRISTOWN, Pa.—When word came out Thursday night that Bill Cosby spokesman Andrew Wyatt would talk to the media, everyone started running. The camera operators grabbed their gear and hustled, with reporters trailing behind them. They moved like a school of fish; you couldn’t miss it. 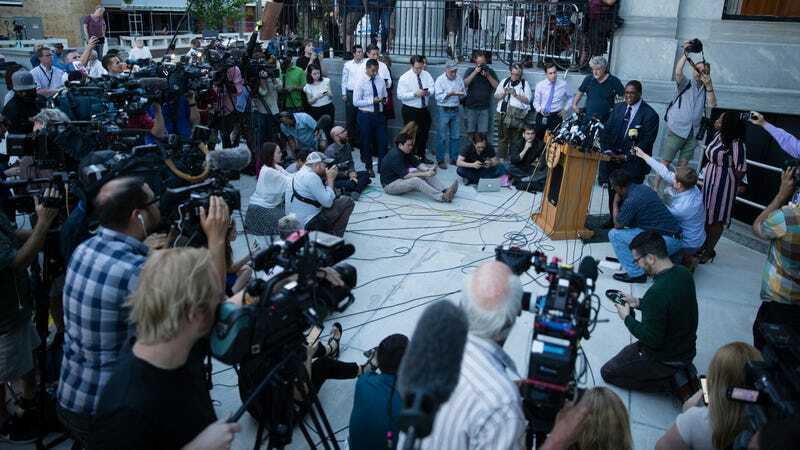 The microphones quickly collected at the podium beside the main courthouse entrance; a large, formal circle formed; and stragglers had to make do by craning their necks or stealing views from the nearby steps. Wyatt wasn’t anywhere near the podium yet; I had seen him going in the opposite direction minutes ago. It didn’t matter. Everyone waited, and Wyatt appeared. “I have no update,” Wyatt said with a smile. The crowd laughed. Then he gave an update anyway, one that would later draw words this morning from Judge Steven T. O’Neill. And even though nearly nothing has happened for a day, aside from hearing the stream of juror questions, reporters somehow had their own. It felt like a press conference after a sports game. Everything was known because it’s all happening right in front of us (minus certain conferences between the judge and lawyers, where reporters and the public aren’t allowed). Yet somehow there were questions—really, just veiled requests for quotes. They weren’t really about anything. Like a press-friendly coach, Wyatt is always game. Earlier in the day, he had already drawn comparisons between the felony criminal trial and the Golden State Warriors. The battle for microphones wasn’t completely one sided, though. On Thursday, there also was a press conference from Gloria Allred, who represents dozens of women who say Cosby drugged and sexually assaulted them. She provided a counterpoint to Wyatt, saying sometimes these things just take time. It’s easy to crack jokes about Allred’s love of talking to cameras, but it served a real purpose. If she didn’t provide a counter to the Cosby PR machine, who else could? This morning, before bringing in the jury, O’Neill brought up Wyatt’s comments. His tone was very stern and at times he spoke directly to Cosby. First, he reminded Cosby that the process was ongoing and his counsel was doing its job, having already requested several mistrials based on the jurors’ deliberations (O’Neill has denied them). He then pointed out that Cosby had a spokesman who seemed to be explaining to the media what is a mistrial, and that needed to stop. He added: “In a case of this size, this magnitude, this length, as long as the jury wishes to continue to deliberate, I will let them deliberate,” he said. He went so far as to explain to Cosby that a mistrial was not a win, as Wyatt had no problem implying, because it meant that Cosby could still be tried again. At one point, he made Cosby answer a series of yes and no questions to establish that his counsel was still acting with his consent and that he understood the definition of a mistrial. When Andrea Constand first sued Bill Cosby back in 2005, saying he had drugged and sexually assaulted her, her lawyer fought against extensive sealing of documents requested by Cosby. They argued that Cosby already had a built-in advantage because he was, after all, Dr. Huxtable and Mr. Cosby. Defendant can convene reporters and offer exclusive interviews; defendant can speak to audiences all over the country, proclaiming himself to be a moral man, above reproach. It is simply the fact that the media is neutral and ready to offer a counter-balance to his self-image, and is also prepared to publish plaintiff’s account as well as the accounts of the Jane Doe witnesses, that troubles defendant. To grant defendant’s motion is even more inequitable because defendant is a public figure, who lectures to the American public about issues such as morality, and entertains audiences with his humor. Indeed, defendant even made “drugging” a topic of laughter at one of his performances, asking an audience participant if she would claim to be “drugged” by him. ... None of these women are here by choice. Defendant chose to conduct himself in this manner. All these years later, that built-in advantage remains. O’Neill said no because there’s simply no law that limits the time jurors can deliberate. If they want to keep going, they can—and he intends to help them review evidence as much as he can. His voice raised, and he hasn’t raised it much through the long process, O’Neill bluntly told McMonagle that he and Cosby’s PR team were creating misperceptions about how the jury system works. “It appears that the court is being ignorant to you, that I am just not give you what you want,” he said of the many requests for mistrials. Over and over, he told McMonagle “give me the case law” that showed he could force the jury to declare a mistrial.